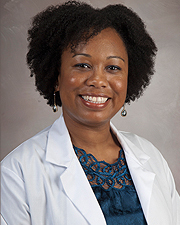 Bethany Williams, PhD, is a clinical neuropsychologist and assistant professor in the Department of Neurology at McGovern Medical School at The University of Texas Health Science Center at Houston (UTHealth). She is also director of the neuropsychology program at the UTPhysicians Neurocognitive Disorders Center and a board member of the Houston Neuropsychological Society. Dr. Williams specializes in neuropsychological evaluation of adults. Her clinical and research interests include dementias (such as Alzheimer’s disease), cerebrovascular disease, stroke, movement disorders (such as Parkinson’s disease), autoimmune disorders (such as multiple sclerosis), pre- and post-surgical neurocognitive evaluation of individuals undergoing deep brain stimulation surgery (DBS) for Parkinson’s disease and interventional cardiology procedures, and capacity/competency issues. With the understanding that the process of seeking evaluation and diagnosis can be a stressful and anxiety-inducing time for patients and their families, Dr. Williams and the staff at the Neurocognitive Disorders Center strive to provide patients with a positive atmosphere and supportive experience. Patient-centered, evidenced-based care is of the utmost importance. For individuals seeking evaluation, a referral from a healthcare provider is required and can be faxed to (713) 383-1435.